Bina Puri is in talks with local developers and foreign parties for the Kota Kinabalu project which will feature hotels, resorts, high-end condos and villas. Bina Puri Holdings Bhd is planning a luxury resort development in Kota Kinabalu that could cost more than RM1.5 billion. Bina Puri Construction Sdn Bhd (BPCSB) managing director Datuk Henry Tee Hock Hin, who oversees projects in Sabah, Sarawak and Brunei, said the development will feature hotels, resorts, high-end condominiums and villas. Tee said it would be Bina Puri's first luxury development of such scale. BPCSB is in talks with local developers and foreign parties, and a joint-venture company will be set up once all parties reach agreement. "It is too early to say when the project will start, but we are looking at it seriously. What is important is to get the right partners in to build it together. "We have seen a few parcels of land. BPCSB will ink some deals soon for the project," Tee said. BPCSB will offer its expertise in design and construction, and assist the local authorities in promoting Sabah tourism, while its partners will provide the funding. Tee said demand for luxury products in Sabah is set to improve over the next few years in line with the state government's plans to enhance tourism, education and healthcare. "Besides the tourism project, we will continue to launch and build high-end developments in Sabah as there are fewer players in this segment in the marketplace." Tee also said that Bina Puri, through BPCSB, will launch Phase 2 of its Jesselton condominium project in Tuaran, Kota Kinabalu, costing some RM50 million. Phase 1, comprising 133 luxury condominium units worth RM64 million, was sold within a year of its launch at end-2006. 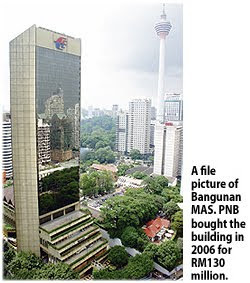 PERMODALAN Nasional Bhd (PNB) may convert Bangunan MAS into a business or five-star hotel and demolish the multi-level podium next to it to make way for a luxury serviced apartment tower worth a combined RM1 billion. PNB bought the 35-storey building on Jalan Sultan Ismail from Malaysia Airlines (MAS) three years ago for RM130 million. The building, the former MAS headquarters, is currently 60-70 per cent tenanted at an average RM3.50 per sq ft.
Its biggest tenants are Jabatan Kebudayaan dan Kesenian Negara and Syarikat Perumahan Negara Bhd, each occupying 10-12 floors. It is learnt that PNB is finalising details of the building plans and working on getting the necessary approvals from the relevant authorities. "It would be wise for PNB to build the apartments from scratch instead of the hotel. Once PNB has finalised the details of the plan, it would demolish the podium, maybe around the second half of 2010 to make way for the apartments," sources said. The podium levels have a huge advantage of large floor plates boasting some 15,000 sq ft to 23,000 sq ft, enabling efficient space allocation for the apartments to generate higher returns. On Bangunan MAS, PNB will be refurbishing the whole building while retaining the existing structures. PNB president and group chief executive Tan Sri Hamad Kama Piah Che Othman, when met at the launch of the Malaysia 1000 (Malaysia Top Corporate Directory) 4th Edition in Kuala Lumpur recently, told Business Times the redevelopment of Bangunan MAS would take place "soon". He declined, however, to give details of the plan but said it would feature high-end products. Meanwhile, the tenants of Bangunan MAS have yet to get any letter from PNB to vacate the building. "If they want us to vacate, they should give us six months notice so we have time to find a new place," said the official of one company, who declined to be named. PETALING JAYA: The Selangor State Development Corp (PKNS) expects to accrue RM380mil from the sale of properties next year, said its deputy general manager (administration and development) Md Nasir Md Arshad. He said the corporation hoped to sell RM342mil in properties this year as demand from the upper-middle class was growing. “PKNS will continue to engage with potential customers on new projects to be launched next year through a comprehensive awareness campaign,” he told Bernama after the official sale of Kasturi Idaman apartments here on Saturday. Under the “luxury and comfortable” campaign set for next year, Md Nasir said the corporation aimed to sell 314 residential property units in Alam Nusantara, Shah Alam, with prices starting from RM335,000. He added that PKNS also planned to offer semi-detached luxury residential units in Kota Damansara with prices starting from RM1.2mil. Earlier, Md Nasir said the Kasturi Idaman project, launched in June 2007 and scheduled for completion in March 2010, would have a gross development value of RM42mil. “Eighty five per cent of the project is completed and everything is on schedule.” he said. TA Enterprise Bhd (TAE) does not plan to enter the investment banking business now, said its chief, citing concerns over costs and returns in the crowded sector. Group managing director and chief executive officer Datin Alicia Tiah said the premium to apply for a investment banking licence was costly compared with the amount of work in Malaysia. TAE would have to pay RM52 million if it wants an investment banking status. "It doesn't make economic sense to pay that much premium to be an investment banker, especially when the field is overcrowded and there are not enough jobs to go around. "I am not saying we won't apply for a licence at all as the situation could change in the future. If there is business to do and money to be made, I may do it," she said. TAE's stockbroking rivals such as OSK Hwang-DBS and K&N Kenanga started operating as investment bankers in 2007, while ECM Libra started investment banking operations in February 2008. Its focus now is to expand its stockbroking arm and it may do venture capital as well. "We will evaluate the market situation before we do things. If the timing is not right, I will not do what is not right then," she said in an interview with Business Times in Kuala Lumpur. Stockbroking contributes around 70 per cent to the group's net profit and revenue, and will continue to do so in the coming years. 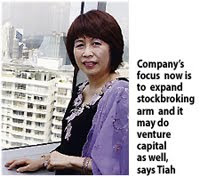 TAE, which has stockbroking operations here and Hong Kong, is also looking to invest in China. The group also has interests in TA Futures, which is a licensed futures broker and asset management. TA Global Bhd made its maiden debut on Bursa Malaysia today but opened at par with its offer price of 50 sen with 2.96 million shares changing hands at the opening bell. Non-Executive Director Datin Alicia Tiah said the opening price was within the group's expectation. "We are confident the stock has much greater value than its current trading price. It is not reflective of the true value of the company," she said after the company's listing today. As of mid-day, the share price slipped to below par at 48.5 sen and stay unchanged as at 3.45pm. Under the IPO, the company offered 460 million shares of 50 sen each, or 12.78 per cent of the company's enlarged issued and paid-up share capital of 3.6 billion shares and 1.2 billion irredeemable convertible preference shares (ICPS). Businesses under TA Global include hotel operations, property management, construction, property investment and property development. Upon listing, Alicia said TA Global would look for more joint venture projects in the domestic and international market. "We already have presence in Canada and Australia. We believe we have enough local knowledge to become a successful property development group. "TA Global is looking at strengthening our presence there with more joint ventures in property development. We want to invest further in Canada and Australia," she added. Currently, in Canada, TA Global owns Terasen Centre, a triple A office building, and the four-star Aava Whistler Hotel. In Australia, it owns the five-star Radisson Plaza in Sydney and the Westin Melbourne. TA Global aims to launch an office tower and service apartment project in Sri Damansara, condominium development in Ampang and residential development in Mont'Kiara. Alicia said the company was planning to launch the first phase of the shop office project by the second quarter or third quarter of 2010. The office tower and serviced apartment project in Sri Damanara, with a gross development value of RM517 million and RM218 million, respectively, is expected to be launched by May and September next year. Meanwhile, the 106.5 million low-rise condominium project in U-Thant will be launched in October while Phase 1 of the residential development in Mont'Kiara is scheduled for launch by November.